Alan Simcoe has been building instruments since 1993. 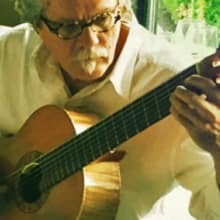 Although his professional output includes many modern and historical designs, he specializes in nylon-stringed guitars in the Hauser/Torres tradition. His formal schooling includes a B.Mus. degree in classical guitar performance. An accomplished player, Alan applies his music sensibilities to the design, building and voicing of his instruments. He is largely self-taught as a luthier, but credits Robert Ruck and Jeffrey Elliot with critical input. I will ship with tracking to the continental United States for $50. Alaska, Hawaii, and international shipments are $150 base and may incur additional charges.